Looks as if Marie Osmond and husband Steve Craig are settling down in Las Vegas for a while. Osmond, who has been headlining at the Flamingo with brother Donny since 2008, is moving out of her rental home in McDonald Highlands in Henderson after buying a home in the same area. dropped to $1.2 million before Marie Osmond paid $885,000. The two story, 5,224-square-foot residence has four bedrooms, 5½ bathrooms and a garage. In the fall, Donny Osmond indicated in an interview that the sibling act, one of the top performing shows in Las Vegas, might be scaled down after 2012 so the two could pursue other opportunities. Earlier this year, it was announced that production was about to start on "Marie!" - her afternoon talk/lifestyle show premiering in the fall on the Hallmark Channel. 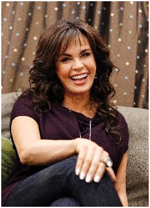 Marie Osmond and Craig, a former BYU star and NBA player, celebrate the first anniversary of their second marriage May 4. They were married in Las Vegas. They were first wed in 1982.